Finally someone who knows what he talks about is bringing out a book, that will bravely engage the problem of privacy vs. publicness. As I wrote in many postings, being paranoid about privacy is not very useful. In his new books, he describes the benefits of being in public. But not only that, he points out that privacy is important. But the privacy advocates are going to far sometimes. This is nothing new at all. The fear of losing your privacy materializes everytime a new technology pops up. We live in an age where we can communicate with the whole world. Everyone is an author, We can speak and write out to everyone. What a dream for our ancestors this would have been. Should we just shut up, saying nothing, now that we have the tools to do it? I'm sure that the new book from Jeff Jarvis, professor of journalism at the City University of New York and blogger at buzzmachine.com, will be awesome. I just listened to an audio excerpt from "Public Parts" and I can recommend doing that, too if you're interested in the topic. Sure you are. 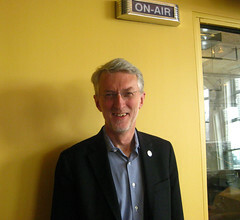 Audio excerpt from Simon&Schuster Website for "Public Parts"
I think this will be a great read, knowing Jeff Jarvis from many publication like "What Would Google Do" and his great weekly appearance at "This Week in Google" with Leo Laporte. Now I only have to made the decision if I buy it as an audio-book or an eBook.